Here’s what we know about the evolution of flight: By about 150 million years ago, the forests were filled with flying — or perhaps just gliding — dinosaurs like Archaeopteryx, possibly similar to the ancestor of modern birds. What we don’t know is what primitive wings were used for before bird ancestors could fly. A study published today in the journal Bioinspiration & Biomimetics provides some fresh data for this debate, not from fossils but a winged robot. There are two main theories for how avian flight evolved. According to the “trees-down” theory, primitive wings were used to glide down from heights. The “ground-up” theory holds that bird ancestors used their wings to “run flap” along the ground, making them faster and better able to scamper up steep inclines that got in their way. The problem with the ground-up theory is the huge speed required to achieve liftoff. By comparison, incremental improvements in gliding could have led to flight. The fossil evidence has been too scant to settle the matter. 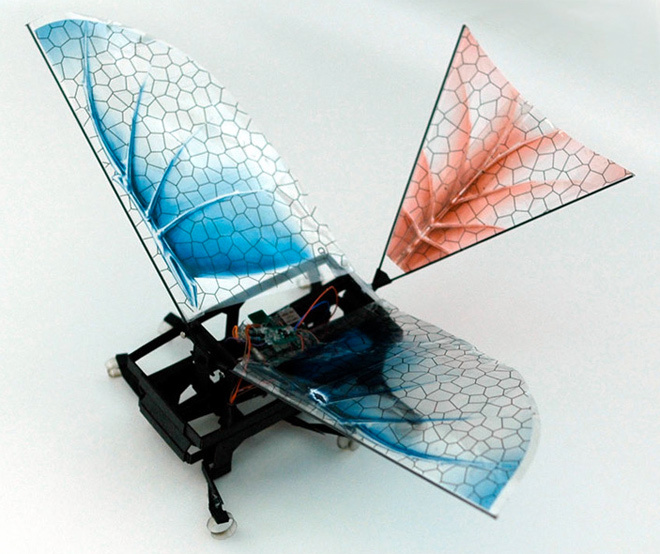 Ronald Fearing and Kevin Peterson, engineers at the University of California, Berkeley, were not thinking about this debate when they created a 25-gram robot called DASH+Wings. It was a modification to a tiny six-legged robot called DASH, for Dynamic Autonomous Sprawled Hexapod — one of the many robots they have developed as sneaky reconnaissance for the U.S. military and other applications. Tiny ground-based robots often have difficulty getting up inclines and over objects, Fearing says, so “we had been working on exploring a hybrid locomotion mode, where flapping wings and legs combine to propel the robot.” Once they had added wings to DASH, they realized that it might be a useful tool for settling evolutionary questions. So they teamed up with Robert Dudley, a paleobiologist also at Berkeley. The team ran DASH+Wings through a series of mini-Olympic events. The bot ran as fast as possible across the floor. It tried to clamber up increasingly steep ramps. And it also jumped from a platform to glide as far as possible from the base. For each of these events, the team compared the bot’s performance both with and without wings, and with its wings flapping or still, all while measuring performance with accelerometers and cameras. Having a pair of flapping wings helped with every test, but especially for gliding. Flapping wings did allow the bot to climb up steeper inclines, and it increased its running speed, but only by 90%, far from the 400% theoretically necessary for flight. In the gliding test, flapping wings allowed the bot to sail even farther from the base than it did with the wings fixed. “This result lends indirect support to the theory that avian flight evolved from tree-dwelling animals and not from land animals that required ground-based running takeoffs,” Peterson says.